This nutrient-packed, high-protein superfood is a staple for many vegetarians. Whether it's used as a salad topping, a stir fry, an appetizer, or a main entree, tofu can be a versatile and healthy choice for virtually any meal. Try baking tofu for a simple and delicious method to enjoy this nutritional powerhouse. With just a few simple steps, tofu can be your go-to meat alternative for a quick and easy meal. First, get your hands on extra firm tofu. Avoid the silken variety, which is too soft in texture for baking. After opening up the package, drain the excess liquid. To soak up any remaining liquid, press the block of tofu against a couple of paper towels. Cut the tofu evenly into 1/2-inch pieces. Now, you're ready to marinate the tofu. Tofu isn't just for vegetarians. These marinades will prove that tofu can be a tasty and healthy complement or centerpiece to any meal, whether you're a meat-eater or not. All of the following recipes call for one package of one-pound extra-firm tofu. This basic recipe is a great starting point for tofu newbies. Many tofu marinades will call for tamari, a much richer, natural-made variety of soy sauce. Tamari is readily available at any grocery store in the Asian foods section. In a separate bowl, whisk together the sesame oil and soy sauce. Generously brush marinade over each piece of tofu, coating both sides. Allow the tofu to marinade for 10-15 minutes. Place the marinated tofu slices side-by-side on a nonstick shallow pan or cookie sheet in an oven heated to 350 degrees Fahrenheit for about one hour. Baste the tofu with the remaining marinade every 15 minutes, until the mixture is used completely. The tofu is ready to enjoy after it feels firm to the touch. The longer you bake tofu, the firmer it will get, so adjust according to your preference. You might want to garnish with chives and sesame seeds for a touch of added color and flavor. Balsamic vinegar adds depth and body to tofu, while ginger, garlic, and pepper add a melange of warm flavors to the dish. Enjoy this with rice and veggies, or toss tofu cubes in a spinach salad for a lighter meal. Combine all of the ingredients above in a large bowl. Add tofu, ensuring all pieces are evenly coated. Refrigerate and marinate for one hour. Transfer marinated tofu to a nonstick cookie sheet or shallow baking pan and place in an oven heated to 350 degrees Fahrenheit. Lemon zest creates a brightness to this savory marinade. Serve lemon pepper tofu with couscous or quinoa alongside vegetables. Whisk all of the marinade ingredients in a large bowl. 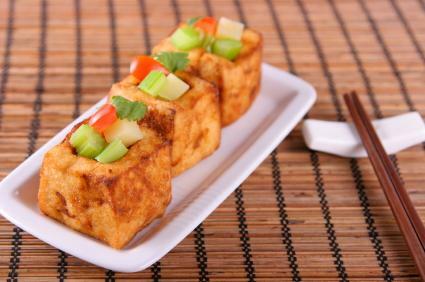 Using a spoon or brush, coat tofu slices on both sides evenly with marinade. Let sit for at least 30 minutes. Bake in an oven heated to 350 degrees Fahrenheit for at least 30 minutes; bake longer depending on desired firmness. Enjoy the smoky flavor of hickory with your tofu. No need to fire up the grill for this quick and delicious take on barbeque. Marinate tofu for at least 20 minutes. Spray a cookie sheet or shallow baking pan with nonstick spray. Place marinated tofu on the cookie sheet in a single layer, topping the slices with freshly ground pepper. Bake the tofu in an oven heated to 350 degrees Fahrenheit for about 20 minutes, flipping the slices and basting with remaining marinade halfway through baking. Favor organic varieties of tofu for fresher, yummier results. Since tofu soaks up any flavor easily, experiment with your favorite spices or marinades for a meat-free meal option. Firm and extra-firm varieties can be used for sandwiches, burritos, tacos, soups, curries, chili and more. Before cooking it, you might also want to try freezing tofu to gain a spongier texture and consistency. This allows the spices and marinades to meld much more quickly, giving your tofu a more robust flavor profile.